This was a pretty calm weekend… I did get some great crafties done at AB’s house along with JC – glitter pumpkins are ALWAYS a hit – they are very fun and festive and don’t involve sharp object – yet another bonus! Saturday evening we went out for a bit to wish Jen a Happy Birthday. The big news of the weekend was that the HOGS actually WON! Clearly, the strategy of ignoring them worked out pretty well! Never fear, two more tailgates left and I’m sure some great pictures too! But the Bears AND the Cowboys both lost in nail biter endings – it was a stressful Sunday! 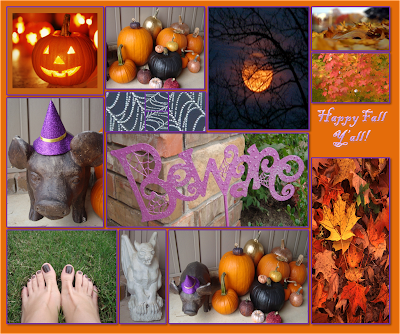 Here’s a little collage of what I did this weekend and some pictures I took, including my new pedicure color. MZ was OK with everything glitter except for the hat on the pig – so I’ll probably take that off. The Gargoyle and The Pig are staples on the front porch! He’s just lucky I didn’t dress The Gargoyle up like a ghost. We are still trying to find some FABULOUS Halloween costumes for the 2 parties we are attending – feel free to suggest something!!! I suggest a caveman and cavewoman duo.